We gathered in great numbers. Most of us had never seen a sight quite like this. We came together for a total solar eclipse. It covered the entire continental US on August 21, 2017. 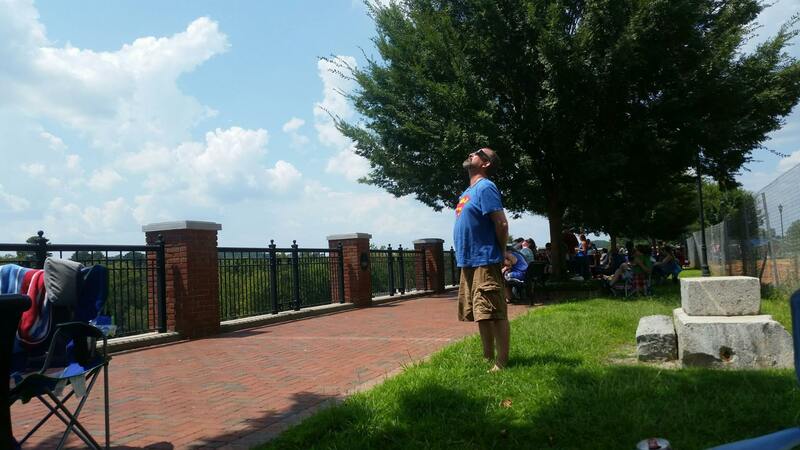 We were down in Columbia, SC where we would see 2 minutes and 30 seconds of totality. There were many others from other states and countries who also flocked. 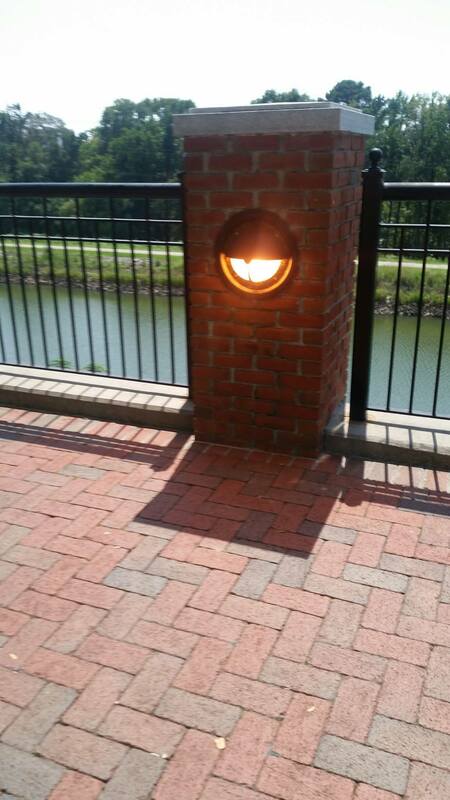 We chose a city park on the river front with a clear unobstructed view. We found a delightful spot in the shade of a tree to wait. We brought chairs, umbrellas, food and drink, books and our sudoku puzzle books. After months of waiting it was finally here. This unique astronomical event was the culmination of an 11 day road trip for us. Along the way we celebrated a friend’s 40th birthday, we visited Cape Cod and Atlantic City, we visited with my cousin and my grandmother and many other friends. We played mini golf and rode roller coasters until we just couldn’t any more. We went to a Raptor Center and saw flacons, hawks, vultures, and owls, and we ate more good food and drank more good drink than I care to recall. It will definitely be time to hit the gym again regularly upon our return. But now the main event was here. This was the cornerstone of our trip – the event which all others were planned around. I had only ever seen lunar eclipses before and those events, while also dramatic, lacked the midday darkness promised by the solar eclipse. In the distance a festival of local bands played. 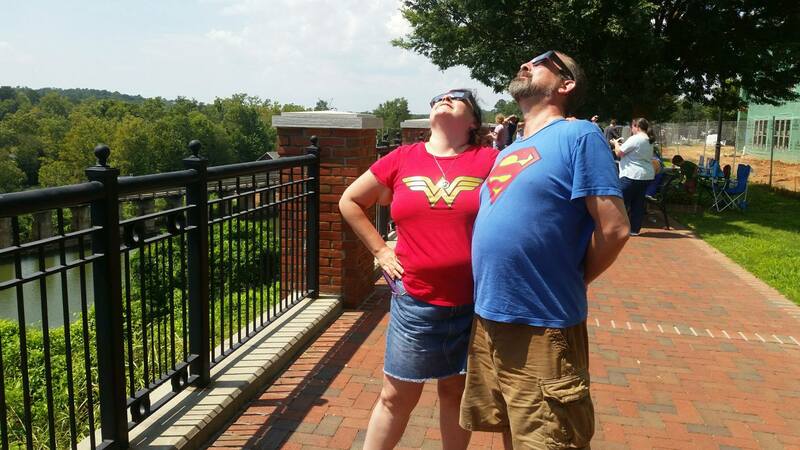 Behind us there was construction but they kindly stopped around when the eclipse began. 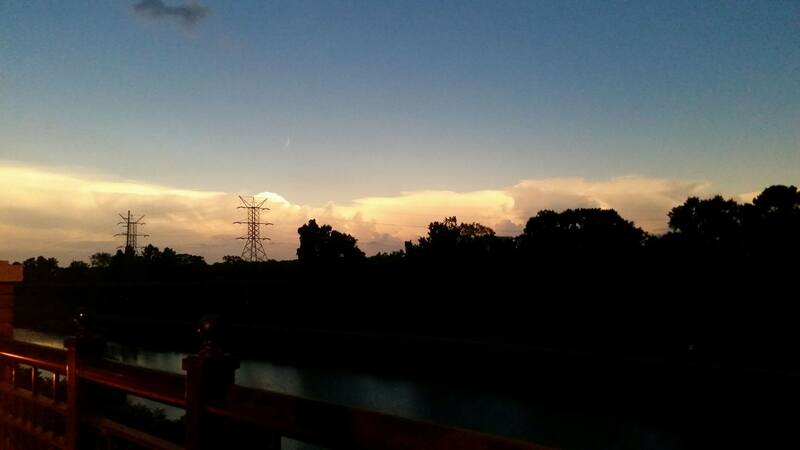 For a bit over an hour, the moon slowly began to obstruct the sun. It was undetectable without our special eclipse glasses. We would get up, gaze in awe for a few moments and then sit down again to wait. It seemed like an ordinary day. The heat of the south was oppressive, but our spirits were in no way dimmed by that. 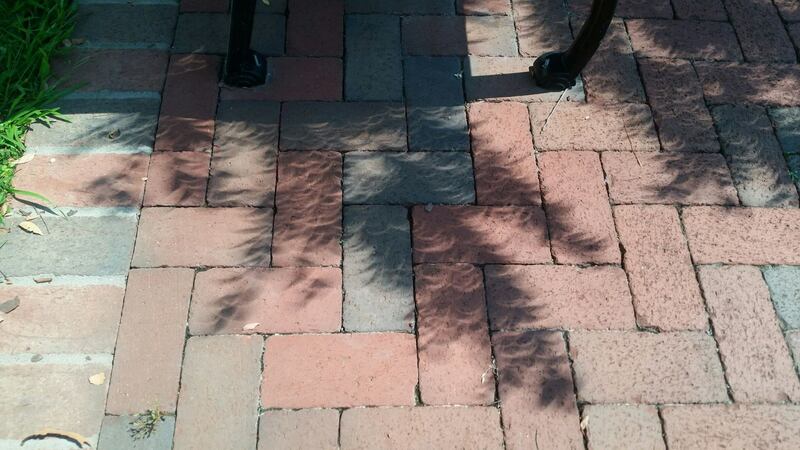 We gazed lovingly at the eclipse shadows cast around us. 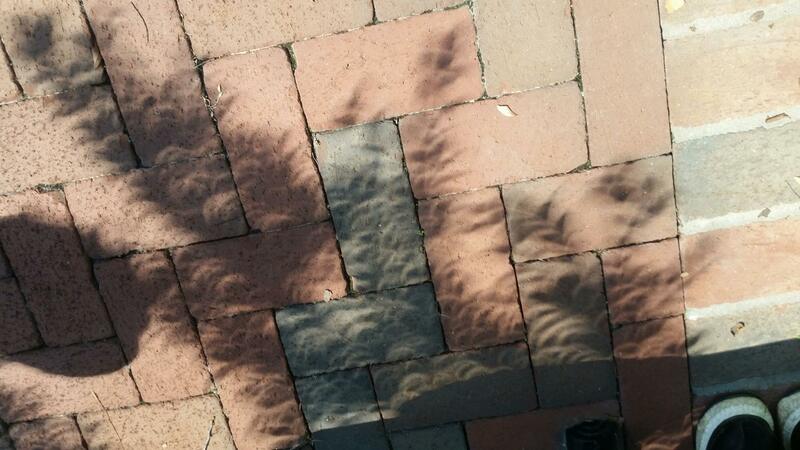 Little slivers of sun in shapes usually only made by the moon were all around us. And we waited anxiously. In the final few moments we began to see other changes. The color around us began to subtly shift. It grew cooler and the insects grew louder. The light itself began to dim and take on a more colorless tone usually reserved for black and white images hand-tinted. The outdoor lights came on in the park as if it was sunset. 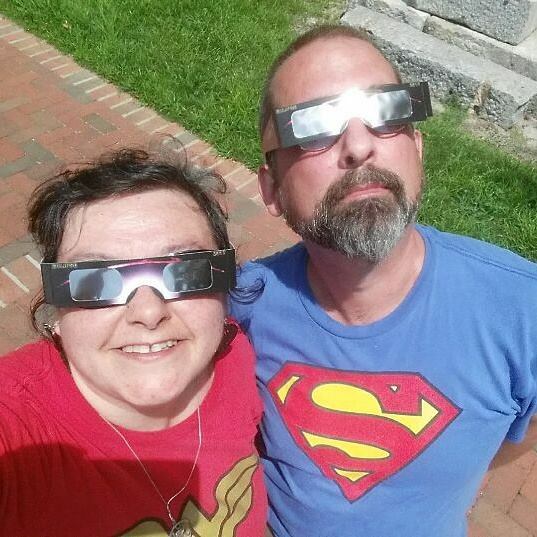 As the moon shifted into complete totality the crowd hushed in anticipation, but once it covered the eclipse glasses came off and the hoots and hollers began. A gorgeous white band surrounded the sun which we could now stare at without our protective eye gear. The band sparkled and the gorgeous corona became visible. It was a wide area around the sun with peaks and valleys usually not able to be seen. It was gorgeous. It was ever bit as stunning as every photograph you’ve ever seen of it. We would go back and forth between gazing at the sun and watching the earth itself. The light got cooler and the sky darkened. It wasn’t as dark as full night, but the end of the sky at first looked like sunset with orange reflected on the clouds. Then it moved into a darker blue and we could see a planet to the right of the sun (Venus perhaps). All around us an insect and human chorus arose. The light was a cool tone like moonlight. And then, too soon, it was over. The sun began to peek out of the other side of the moon. It created the diamond ring affect with a full ring and the sparkle of moonlight on one end. I couldn’t see any solar flares or other features since I had forgotten to bring binolculars, but it was astounding none the less. For a couple brief moments the earth stood still. We held our breath together. The night came briefly in the middle of the day. It was easy to understand how this has inspired awe for centuries and I felt a desire to reread “A Connecticut Yankee in King Arthur’s Court” by Mark Twain. In hindsight, it might have been the perfect vacation book to bring. In the book, a man ends up traveling back in time and uses his knowledge of the impending eclipse to prove his power to the unknowing masses. Here we were all equals. We had the power of science and the Internet to prepare us for this event. 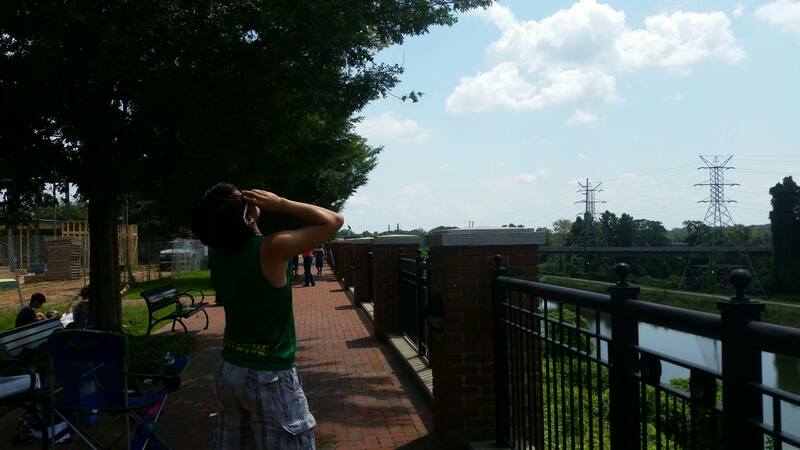 I had extra eclipse glasses with me,but could find no one who needed them…an enlightened populace indeed. And now a longer wait begins…first on the jammed roadways as everyone exited the totality zone, and then to wait for the next solar eclipse on US soil on April 8, 2024. Less than 7 years away and coming much closer to my home in southern NH. I know I’ll be there and I recommend you be there too!